Last Wednesday, the Central Asia-Caucus Institute (CACI) Silk Road Studies Program at the Johns Hopkins University hosted a panel featuring the ambassadors from Kazakhstan, Kyrgyzstan, Tajikistan and Uzbekistan, as well as officials from the U.S. Trade Representative, to discuss the Central Asian states’ path to membership in the World Trade Organization (WTO). The WTO is an international organization with 158 member states that assists “producers of goods and services, exporters and importers conduct their business.” Membership in the WTO is not easy, and requires countries to institute significant reforms in the areas of trade, tariffs, customs and industry. All members of the WTO adhere to the principles of non-discrimination in practices of international trade. The WTO also promotes the principles of open trade with low trade barriers (tariffs, duties, import bans and quotas), predictable and transparent trade patterns, free and fair competition and environmental protection. For economies in transition, WTO membership provides the invaluable benefit of having a seat at the negotiating table. 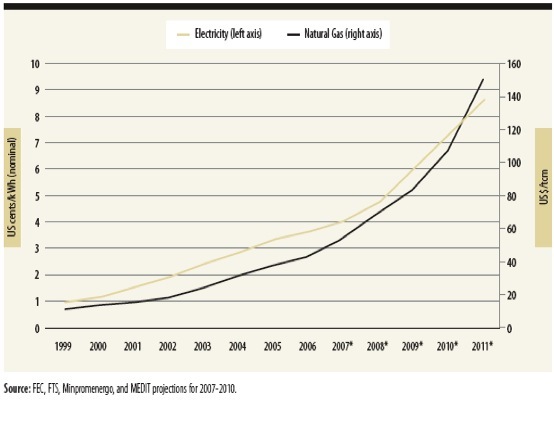 Like many post-Soviet countries, Kazakhstan’s government heavily subsidies domestic electricity consumption. Now, when Russia joined the WTO, domestic prices for electricity consumption were forced to gradually increase. During the 1990s, Gazprom essentially provided gas for domestic consumption for free, generating a profit on its hard-currency exports to Europe. After Russia joined the WTO in 2008, Moscow had to gradually increase the price of domestic electricity consumption, as one of the requirements of membership is that domestic industries do not gain unfair advantages via government subsidies. Gazprom had to provide its services “at cost.” Consequently, electricity costs for household gradually increased. On the surface, one would assume that such an increase in electricity rates would generate widespread resentment and political unrest. However, the Russian public has absorbed the gradual price increase, as real per capita income has steadily increased since 2001. The increase in real income managed to offset the changes in energy rates. 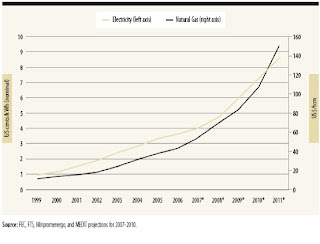 Source: "Energy Efficiency in Russia: Untapped Reserves," IFC/World Bank, 2008. I compare Russia’s experience with Kazakhstan. I have not found a lot of political-economy literature on Kazakhstan’s WTO admission since 2008, and all of the papers published prior to the global financial recession are fairly outdated considering the world average price of oil has achieved record high levels since 2009 and the banking sector has undergone major reforms. 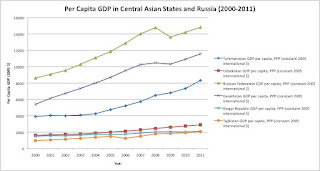 I also have not found any models on the effect of WTO admission to Kazakhstan’s domestic energy market, and how the removal of government subsidies for electricity for household domestic consumption will alter per capita GDP growth as well as other macroeconomic and social indicators. 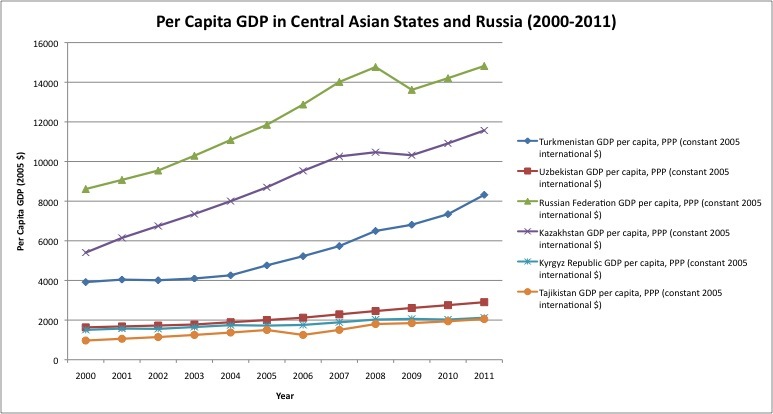 While the table below indicates that Kazakhstan’s average per capita GDP has been steadily increasing, following an upward trend like Russia, income inequality has also increased and the provision of electricity services throughout the country is inconsistent. Nearly 8% of the country lives below the poverty line and as of 2009, Kazakhstan ahs a Gini index of 26.7, according to the CIA world indicators database. At the panel, I asked the USTR representative about the effect of domestic fuel subsidies on Kazakhstan’s economy. She noted that in Russia, WTO admission had a more profound impact on this sector because gas is so intertwined with other sectors of the economy and relates to fertilizer production, among other sectors. This was just a quick, general comment after the panel, so running the numbers would be pretty interesting. I also found the comments by the Ambassador of Uzbekistan pretty interesting. He discussed delaying admission to the WTO until Uzbekistan is ready. “We must consider under what conditions we will enter.” Politically, the Ambassador’s comments could be interpreted to mean that Uzbekistan does not want to submit itself to the rules of the WTO as the regime remains fairly closed off in terms of economic participation. However, to give credit where credit is due, the Ambassador does make a good point. WTO accession does impact a country’s economy. Uzbekistan now hosts a textile industry and a GM automobile plant. Many parts of the country regularly experience electricity outages and fuel is heavily subsidized. Plus, the cotton monoculture inherited from the Soviet Union remains one of the country’s major industries. They don’t call it “white gold” for nothing. Finally, it is interesting to look at the entire Central Asia region in the context of WTO membership. Tajikistan recently gained membership into the WTO earlier this year and Kyrgyzstan entered the organization in 1998. With that said, Kyrgyzstan and Tajikistan have experienced political, domestic turmoil and their share in global trade is miniscule. Tajikistan’s aspirations to develop its hydroelectric capacity have been thwarted by political maneuvering by Uzbekistan. Plus, the country lacks domestic capacity for industrial manufacturing and nearly half of its workforce is in Russia or Kazakhstan as migrant workers, sending remittances home. I salute Tajikistan for its WTO membership, but in order to take advantage of the benefits of the WTO trading system, significant domestic reforms must be instituted in order to make the country an attractive destination for foreign direct investment and business development. Kyrgyzstan must also work on strengthening domestic institutions and promoting a business friendly environment. Above all, the Central Asian states must crack down on corruption by low-, mid- and upper-level officials. Corruption and bribe-taking acts as a tax on the population and encourages entrepreneurs to circumvent formal rules and participate in the informal economy. While Central Asia is making progress towards full integration into the global trading system, domestic reforms must be seriously undertaken. Membership in the WTO is half the battle. The domestic legal structure is in place, now the regimes must focus on strengthening domestic, institutional capacity. Implementation is a long-term process, but under the right conditions of genuine political commitment, financial and technical assistance, Central Asian states can become active WTO members who benefit from and contribute to global commerce. I am truly delighted to read this post which contains plenty of helpful facts, thanks for providing these data. Great article, exactly what I needed.